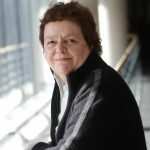 Line Chamberland, PhD in sociology, is a professor at the Sexology Department of Université du Québec à Montréal (UQAM). She has conducted studies on various forms of social exclusion affecting sexual minorities, in particular in institutional contexts: education, workforce, health care, and social services. Her most recent research projects include Understanding Inlcusion and Exclusion of LGBTQ People, as well as a collaborative qualitative research project focusing on trans youth (14-25 years old).